Plateaus and weight fluctuations while dieting - Who doesn’t know that? Almost everyone who diets hits a plateau after some time. This often leads to frustration. Then sudden weight fluctuations (gains or drops) happen overnight. With this article I would like to shed light on the mysterious weight loss process. Often, when we start dieting we see a significant weight drop (a few kilograms) in the first days. Then, the number on scale gets stuck and doesn’t decrease for a long time until a sudden drop occurs. The weight loss seen at the beginning of a diet is primary due to water loss and the loss of food volume/weight from our gastrointestinal tract, as usually we reduce our food intake. Why does water loss occur? Processed foods. Reduction of processed food intake can lead to water loss. Processed foods often contain a high amount of salt and high glycemic index (GI) carbohydrates, such as sugar and starch. Salt retains water in the body. High GI carbohydrates increase insulin, which leads to salt retention that in turn results in water retention.1 For this reason, cutting out processed food naturally reduces sodium intake and induces the loss of retained water. Glycogen depletion. Additionally, calorie and carbohydrate reduction also results in water loss. A significant amount of glycogen (carbohydrate reserves) is stored in our muscles.2 One gram of glycogen binds 4 grams of water. In the first days of dieting, when we deplete glycogen stores, we not only lose our carbohydrate stores but also lots of water. One study put numbers on it and measured weight loss (not fat loss) of 11 women after 4 days of a highly calorie restricted diet (energy intake of ~400 kcal/d).2 On average, the subjects lost 4 kg, whereas a weight loss of 2 kg was observed at the lower end of the spectrum and 7.4 kg in the extreme case. Indeed, one of the subjects lost entire 7.4 kg in 4 days. Clearly, this weight was not fat but probably mostly water (7.4 kg fat loss would theoretically require an energy expenditure of over 63,000 kcal, which cannot be achieved in 4 days). After the first week, when the body adjusted to the new diet and no drastic changes happen any more, often a weight loss plateau occurs. The number on scale decreases very slowly, if at all. During this mentally challenging time, when we don’t see any progress and doubt the efficiency of the weight loss diet, only one high salt and/or high carbohydrate meal can lead to drastic “weight gain”. 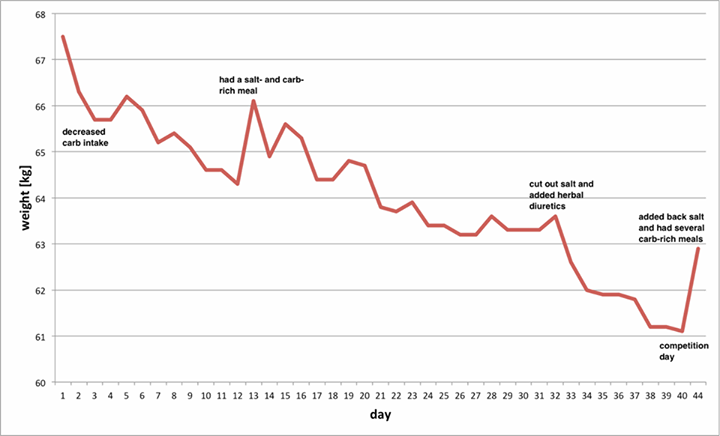 It seems like we gained all the weight we lost overnight, just from a single meal (see image). However, as you already suspect it isn’t the case, at least not for fat gain. High salt/carbohydrate intake leads to water retention (exactly the opposite of what happened in the first days when we reduced those nutrients) and the number on scale increases. Here, the most important thing is not to panic and keep dieting. The gained water weight disappears again after a few days. However, during long weight loss diets, a high carbohydrate meal can be beneficial to drop water weight. During long periods of caloric restriction, especially when accompanied by high exercises volume, the cortisol level (stress hormone) increases. Too much cortisol is associated with muscle degradation, decreased immune function, impeded recovery6 and water retention (see Minnesota Starvation Experiment). One of cortisol’s physiological roles is to guarantee energy availability in times of energy deficit (to keep blood sugar high enough for essential functions). For this reason, we have the highest cortisol levels in the morning after an overnight fast.3 A carbohydrate rich meal increases blood sugar and decreases the need for cortisol secretion. This decreases cortisol level and leads to the “magic” water loss overnight. Often, when we diet and see only slow weight loss (less than one pound per week) we feel as if our diet doesn’t work. However, one pound for week is a good number, considering that the general recommendation is not losing more than 0.5-1% of body weight per week.4 A reasonable calorie deficit of 500 kcal per day results in approx. 400 g fat loss (1g fat = 9kcal) per week, in theory (although biological system, such a human bodies, don't necessarily follow theories). Sadly, 400 g per week we often don’t even consider as weight loss and are disappointed about the results. What should we do - increase calorie deficit and exercise volume? Well, a high calorie deficit (such as ~ 800kcal/ day) is very likely to lead to significant muscle loss, as seen in a recent study on a competitive bodybuilder.5 The weight he lost dieting for a competition consisted of 43% lean body mass. This is definitely not ideal, as most people would like to lose fat and not muscle. For this reason, drastic calorie restrictions and very high training volumes are not an optimal dieting strategy in my opinion. If you are on your weight loss journey and have the feeling that nothing happens or you lose weight too slowly (around 400g/ 1lbs per week) and you are really sure to be in caloric deficit, then relax and remember, that slow weight loss is consistent weight loss. Rapid weight drop is often caused by water loss and is not sustainable, as the weight will probably increase after the next carbohydrate/salt-rich meal. If you diet for a long time and nothing happens, then your stress hormones may be elevated. In this case, the better strategy might be to increase your calorie intake (if calories are severely restricted) and reduce your exercise volume (if your exercise volume is too high) instead of cutting calories even more and further increasing exercise volume. Side note for women: Premenstrual symptom (PMS) can induce water retention of up to 2kg/ ~5 lbs due to hormonal changes. This is an additional factor to consider. Osterberg, K. L., Pallardy, S. E., Johnson, R. J. & Horswill, C. a. Carbohydrate exerts a mild influence on fluid retention following exercise-induced dehydration. J. Appl. Physiol.108, 245–50 (2010). Kreitzman, S. N., Coxon, Y. & Szaz, K. F. Glycogen storage : illusions of easy weight weight regain , and distortions in estimates of body composition3. Am J Clin Nutr56, 292S–293S (1992). Kaushik, A., Vasudev, A., Arya, S. K., Pasha, S. K. & Bhansali, S. Recent advances in cortisol sensing technologies for point-of-care application. Biosens. Bioelectron.53, 499–512 (2014). Helms, E. R., Aragon, A. a & Fitschen, P. J. Evidence-based recommendations for natural bodybuilding contest preparation: nutrition and supplementation. J. Int. Soc. Sports Nutr.11, 20 (2014). Essentials of Strength Training and Conditioning, 3rd Edition, Baechle, T. R. & Earle, R. W.